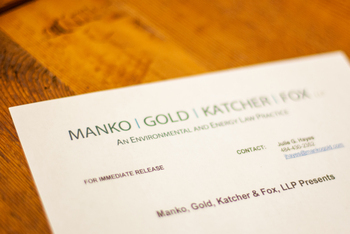 Philadelphia, PA (September 7, 2011) – Suzanne Ilene Schiller, a partner with the environmental and energy law firm of Manko, Gold, Katcher & Fox, LLP ("MGKF"), has been selected as a Fellow of the Litigation Counsel of America ("LCA"), a highly-selective trial lawyer honorary society composed of less than one-half of one percent of American lawyers. She focuses her practice in the areas of real estate and complex civil litigation. Ms. Schiller has represented Fortune 100 companies, leading shopping center owners, commercial real estate developers, big box tenants, building contractors, and municipalities such as the City of Philadelphia.